On June 16th Ramsey Coote Instruments will relocate to a new facility. The address details will be: 18 Fonceca St, Mordialloc Vic 3195 Australia and phone is +61 3 95800522. It has been a very interesting and exciting time for Ramsey Coote Instruments during the past six months. I can’t believe the last update here was in July and I am sure that I am not the only one thinking where has the year gone!! It is always a good idea to look at achievements and during this tough economic time we seem to be getting on with our business of helping practitioners by manufacturing and servicing our products to help children become dry at night. We will be closing from 21st December 2012 to 21st January 2013 so please send your repairs or orders in prior to this date or after the 21st January. In August and November we attended meetings in New Zealand. At the first meeting, the Primary Healthcare Nurses meeting in Hamilton, and in Palmerston North was the Paediatric Society meeting where one of our clients presented an abstract on their bedwetting practice in the community. We attended the combined IUGA and Continence Foundation of Australia Meeting in Brisbane and unfortunately the program was focussed more on the surgical aspects rather than the usual blend of information and discussion that suited our clients, also very limited information for those helping children. This is disappointing as there is limited opportunity for us to hear up to date information that relates to every day clinical practice. In October Ramsey Coote had a stand at the American Academy of Pediatrics meeting in New Orleans, USA. Again there was lots of interest in our products and we are discussing the opportunity of a study with one of our contacts there. 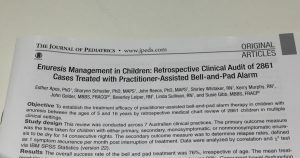 Research and evidence is the name of the game in today’s clinical practice so we are delighted to be a recipient of a voucher program run by our state government that will help support the analysis of a project titled, “Review of Bed Wetting Treatment Practices in Children Using the Bell and Pad Treatment within Hospitals, Community Continence Clinics and Private Practice.” This will be one of the largest analysis undertaken on bedwetting treatment and the outcomes will show how effective the bell and pad system is along with how the treatment is conducted so I am sure that we will all learn new information that will help the clinical practice world wide. It will provide up to date evidence rather than rely on older review articles. We look forward to a happy, healthy and prosperous 2013 for all our colleagues, clients and users. If you would like more information about any of our products please contact us.